Tokyo Gas is beefing up efforts to popularize its "My Home Hatsuden" products, which use natural gas to generate household electricity. Tokyo Electric Power Co., Inc. (TEPCO), despite intensifying its push for all-electric housing, has expressed alarm and opposition to Tokyo Gas. 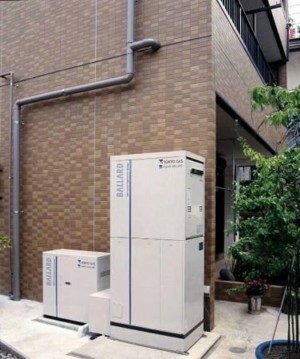 Last year, Tokyo Gas released the LIFUEL household fuel cell cogeneration system, which extracts hydrogen from natural gas along with oxygen from the air to generate electricity through a reverse chemical reaction. This year, Tokyo Gas expanded its lineup with the ECOWILL system, which uses a natural gas-powered engine to generate electricity. Both of these "My Home Hatsuden" products aim to capitalize on household energy demand at the expense of electric power companies. LIFUEL and ECOWILL use the heat exhausted during electricity generation to heat household water. While able to supply 40 to 50% of the electricity for an average family of four, they can provide sufficient quantities of hot water. High power-generation efficiency and heat efficiency mean both systems are able to cut the amount of electricity required for heating water by 20%, contributing to reduced carbon dioxide emissions. Use of LIFUEL can save about 60,000 yen (US$520) per year in heating and lighting costs, while ECOWILL can save about 27,000 yen (US$235) per year. The higher-priced LIFUEL system rents for 100,000 yen (US$870) per year. Government subsidies are available for purchasing ECOWILL, so the cost to the consumer is 6 to 7 million yen (around $5,000 to $6,000). Tokyo Gas was initially focused on developing household fuel cells. However, after TEPCO stepped up efforts in its push for all-electric housing, Tokyo Gas decided to counter by focusing on ECOWILL until fuel cells achieve full-scale popularization -- which they believe will occur around 2008. Tokyo Gas plans to increase the installation of ECOWILL and LIFUEL in general households from 200 units in 2005 to a cumulative total of 43,000 units in 2010. Norio Ichino, President of Tokyo Gas, expects "My Home Hatsuden" to play a key role in their business in 4 to 5 years.